Director Kevin Smith protesting the protesters protesting his new Red State movie at Sundance 2011. Kevin Smith is the man. 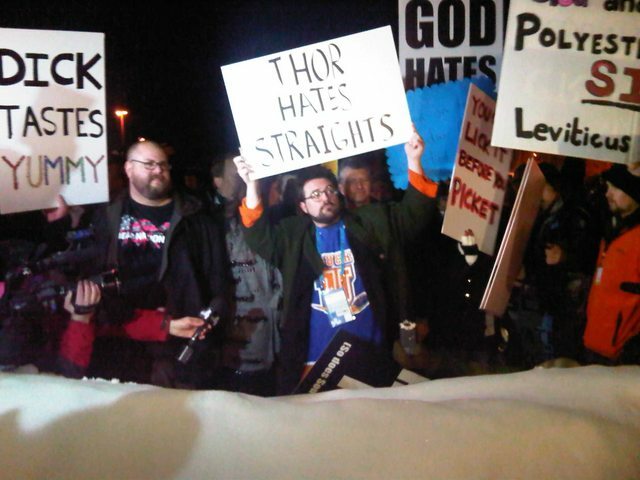 Nice sign: Thor hates straights. Well, he promised a spectacle and Kevin Smith certainly delivered at the 2011 Sundance Film Festival this weekend. Following months of build-up, the opinionated filmmaker finally premiered horror thriller Red State in a frenzy of religious protests, comedic counter-protests, speculation and media bashing by the chatty writer/director. And once the film finished, then came the promised auction of the rights, which ended somewhat quicker than expected when Smith bought them himself for $20. Red State will have a full cinema release on October 19, 2011, which just happens to be the 17th anniversary of Clerks’ original US release. Red State – Official Teaser Trailer.